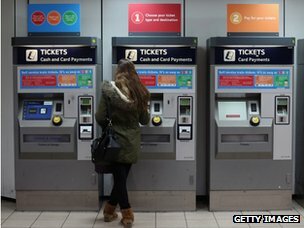 Some rail fares in England will rise by 6.2% in January - about double the rate of inflation - although other price rises may be higher. The Retail Prices Index (RPI) measure of inflation in July - which stood at 3.2% - is used to calculate the rises. There are no fare increases currently planned in Northern Ireland, where fares are not linked to RPI, after a 3% rise in April. 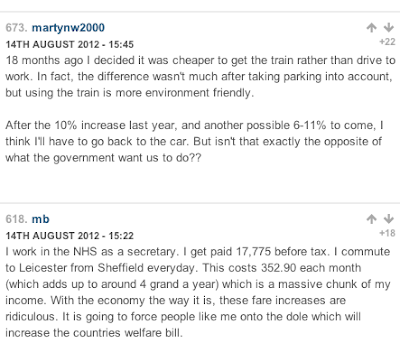 "The decision to have different formulas for fare rises is a political one. In Scotland, 75% of the cost of the railways comes from a government subsidy - higher than in England. 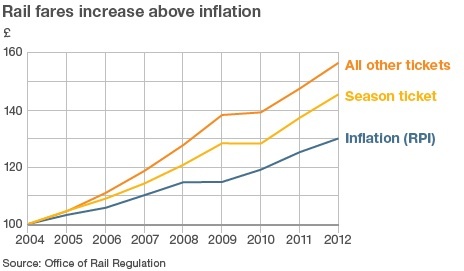 Mike Hewitson, of watchdog Passenger Focus, said: "This is another inflation-busting increase. "There is only so much you can squeeze passengers. The government needs to think again about the plus 3% [formula]." BBC transport correspondent Richard Westcott says passengers and taxpayers used to split the cost of running the railways, with both sides paying about half each, but successive ministers have cut the amount of government funding and that has resulted in regular fare rises. The latest rise means fares in England will have gone up by more than inflation for 10 successive years, resulting in some of the most expensive train journeys in Europe although some tickets booked well in advance can be cheap"
'Necessary rise'"In return for these whopping fare increases, rail travellers can expect cutbacks to services and more unmanned stations, creating safety risks for those travelling at unsociable hours." TUC general secretary Brendan Barber said: "Commuters could see the price of their season ticket going up three times faster than their pay rise. But Michael Roberts, chief executive of the Association of Train Operating Companies, said: "It has been government policy during the past eight years for passengers to pay a larger share of the cost of operating the railways and to focus taxpayers' money on investing in longer-term improvements to the network. "Any flexibility train companies have within the rules is to maximise revenue for the government." 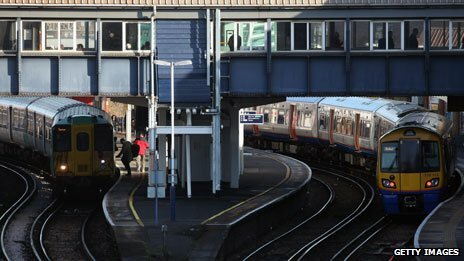 Transport Secretary Theresa Villiers said that the fare increases were necessary in the short-term to achieve the government's long-term goal of bringing down the cost of running railways. 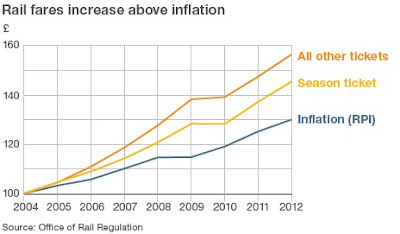 "In the longer term we are determined to get rid of these above-inflation fare rises all together," she said. "But in the meantime I'm afraid these fare rises are going to be necessary in order to help us deliver a rail investment programme at a time when the deficit means public spending needs to be constrained," she added. Shadow Treasury minister Rachel Reeves said: "These fare rises are unacceptable at a time when families are already struggling to make ends meet and wages are stagnant at best." The official inflation figures from the Official for National Statistics show that the Consumer Prices Index measure of inflation rose from 2.4% in June to 2.6% in July. The rise in the rate of CPI follows three months of falls. RPI rose to 3.2% from 2.8% in June. I wanted to look further into costs of train journey's as costs for train tickets are getting more expensive. As a commuter I also want to know why in January I will be paying 6% more. It has some very interesting facts about how expensive train fares can be, in comparison to other countries and nationally. It summarises how unjust the fare system is. This is something I had previously wanted to look at - season or 'advance' tickets, and how this can alter your travel costs as well as time of day and week. Even though this article is from January 2012, it shows how the previous rise did to travellers fares, and gives insight in to what may happen all over again next year. 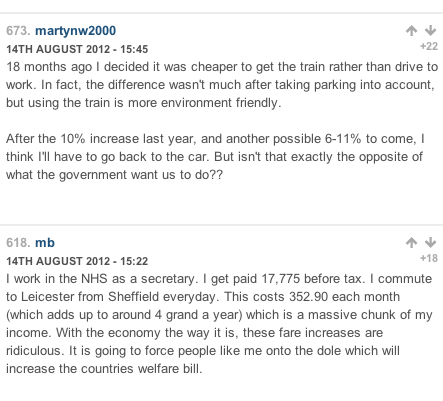 Rail fares have gone up again, leading to claims that Britain has the most expensive trains in Europe, if not the world. 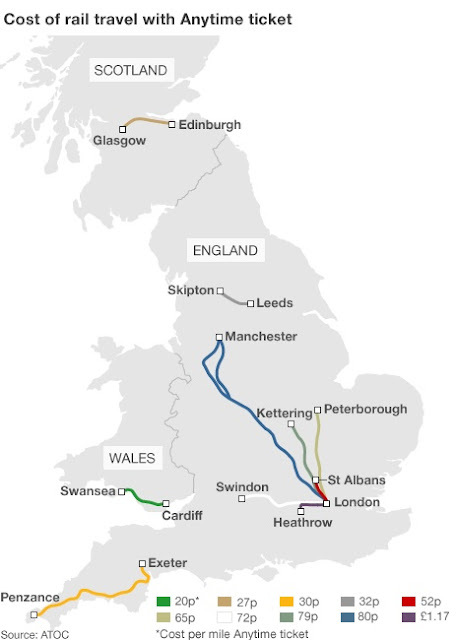 So what is Britain's most expensive stretch of railway? "You shell out thousands of pounds a year in exchange for half an hour standing with your face hidden behind the Daily Telegraph - or a copy of Metro - an elbow in the back, and from the public address system comes a series of garbled announcements about "the late running of this service". Such is the caricatured experience of the commuter on Britain's expensive and overcrowded railways. The arrival this week of a 6% hike in rail fares brought a mixture of weary resignation and anger from passengers. Season tickets to London from Stevenage reached £3,200, Leeds to Sheffield £2,148, and Manchester to Liverpool £2,688. Swansea to Cardiff is now £1,468 and Glasgow to Edinburgh is £3,380. Recent research by the Campaign for Better Transport suggested that season tickets for commuters around London cost more than three times those of their Spanish and German equivalents, and 10 times more than those in Italy. Much of the anger seems to be focused in England, particularly in the South East and London. In Scotland, ticket prices tend generally to be lower, reflecting higher subsidies. So what is the country's most expensive stretch of railway? The obvious answer is the Heathrow Express, which clocks in at a rate of £1.17 a mile. But this is a one-off route used mainly by business travellers. To search for the most expensive journey is to plunge into a blizzard of complexity and opaque terms and conditions. The Association of Train Operating Companies (Atoc) says it operates services between 2,500 stations so cannot break them all down on a cost per mile basis. Once upon a time, it would have been simple. Up until 1968 British Rail used a rigid price formula of 3.25d per mile (1.35p in decimal money). Adjusted for inflation it works out at about 20 pence per mile. Perhaps surprisingly the average cost per mile today across the whole of the network is indeed about 20p. Railway expert Barry Doe says that in practice little changed until privatisation, at which point prices quickly diverged between the cheaper and more expensive routes. Peak fares - known as Anytime tickets - some fares are close to reaching a pound a mile. Take a train at peak time from London to Manchester and the customer is charged £148 or 80 pence a mile. Atoc is quick to point out that only 2% of people - mainly business travellers - use Anytime tickets. Britain has opted for an airline-style pricing structure, which means it has the widest range of train ticket prices in the world. So a return ticket from London to Manchester varies from £296 to £24 depending on how flexible you are willing to be about when you travel. "We've got the most aggressively expensive and the most aggressively cheap tickets. And more people have benefited from the cheap fares than have disbenefited from the expensive tickets," Smith says. Last year there were 1.4 billion journeys by rail - the highest number since the 1920s, when the rail network was around twice the size it is now. There's the man who was fined £155 for getting off his train one stop early and thus breaching the terms of his advance ticket. And booking a triangular journey is not easy. If you enter London to Liverpool, returning via Leeds, into the Trainline's website, you are greeted with the response: "No tickets are available, please refine your search". Customers who do manage to book these kind of journeys have usually been clever with advance tickets. Buying even off-peak tickets can be expensive. "Don't look for logic in the fares structure," says Mike Hewitson, head of policy at consumer watchdog Passenger Focus. "Most passengers think logically that if you travel further it will cost more. But there are a whole load of other factors outweighing that." It's a mess, says the Financial Times journalist Matthew Engel who travelled around Britain by train for his book Eleven Minutes Late. "The fare system is both unjust and intolerably complex. If you are lucky and clever and have the time to tailor your journey to the way the system works then you can take advantage." 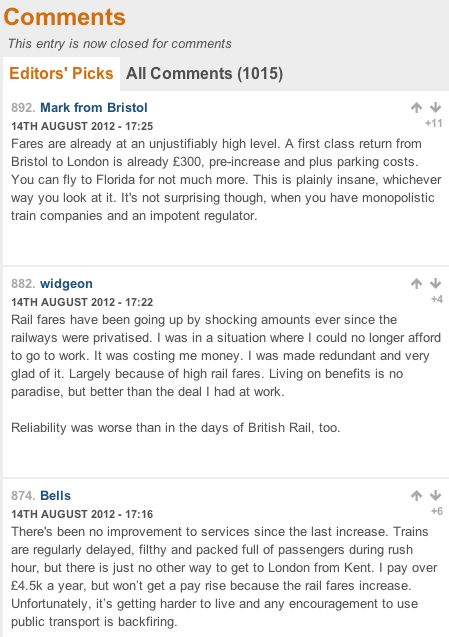 One thing nearly everyone agrees on is that costs have risen since British Rail was privatised. However, the chance of any government deciding to fund the renationalisation of the railways is about as slim as every commuter on the 07.45 from Reading to London getting a seat. Neither will subsidies bridge the gap - the government has said it wants to bring subsidy down nearer to 20% of the ticket price rather than the 30% it is today. The hope is that the government's ongoing review of the fares system will come up with sensible tweaks and limits on prices. Even the train operators agree that there is a need for change. "Our fares system remains largely unchanged since privatisation and no longer properly reflects how people travel today," an Atoc spokeswoman says. But railway enthusiasts like Doe worry that such a review may see an even greater shift to advance booking. "We need to fight for the walk-on system that is unique and vital to railways. Advance fares must not be allowed to dominate." I wanted to begin my research with looking at transport costs of my fellow students as this is easily accessible information with trustworthy, reliable feedback, allowing me to work out the average cost to students per week travelling. I sent out a message via the student Facebook group set up for our course specifically by myself and Joe. Many students have claimed that the bus is their most commonly used method on a week to week basis, with the average price for students to travel about is £12 per week, when based on the average of the 20 students who participated. Several said they had a yearly bus pass which is £320 per year, working out at £6 per week. Other students walk or catch the odd taxi to keep costs to a minimum. Four students who answered, commute via train and therefore their weekly costs are higher than others. This is the same for Melissa who also drives, and pays for petrol as well as buses on a weekly basis. From the survey I have seen that transportation costs can be kept down if you walk or catch a bus opposed to paying for trains and taxis which average at £5 per trip. 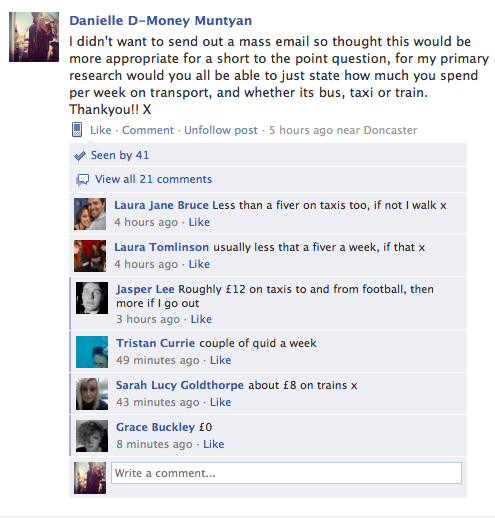 £45.00 x 4 = £180.00 per month spent commuting to and from College. Here is some research on local travel and the packages they offer saving money, with timetables and my own train and bus tickets. My train tickets for one journey to college. Bus pass overs for particular age groups - 16 - 18 and 16 - 21 with Travel South Yorkshire allowing cheaper fares. £94 per month pass for travel all around South Yorkshire. National Express Rail Card for Season Ticket Holders.